Cucumber Velveteen  - $8.00 : Yarn Tree, Your wholesale source for cross stitch supplies. Item 8815. Cucumber Velveteen. 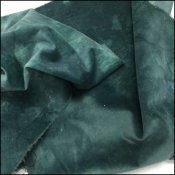 100% Cotton Hand-Dyed Velveteen. Size per package is a fat eighth, 10” x 18” (selvage not included in measurement). Similar in color to DMC 500. Perfect for needlework finishing, applique, quilting, or anywhere your creativity takes you. Ripped, not cut to maintain fabric grain.